If you believe in faeries shout it out! You can enter up to three times. Post a reply below, tweet @pixiehillstudio, and hop over to my facebook page and leave a comment. 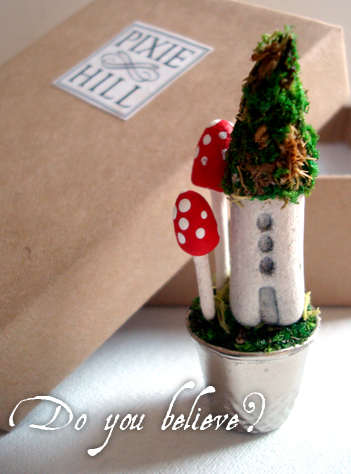 On Friday a winner will be randomly picked and sent the little thimble pictured above. Be sure I can contact you if you win. Winner will have 3 days to send contact info. If the winner fails to answer a second entry will be chosen in it's place. Please, enter only once per entry type. I dunno if its worldwide but if it is, count me in, if its not, good luck to everyone :D And doesnt it makes you wanna know wich home is going to get each of ur creations? without question, Casa de Cuckoo believe in the fae. I am clapping for fairies~! aww that is adorable! and yes of course ~ i believe! Yes, I do. There is such energy in nature, how can I not? positiveponderings AT hotmail DOT ca.